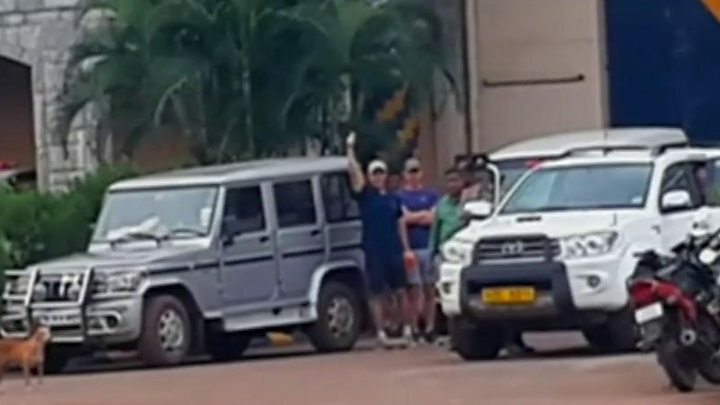 Six British former soldiers have been released from an Indian prison four years after being arrested and detained on weapons charges. The so-called Chennai Six, who had been guards on a ship to combat piracy in the Indian Ocean, won an appeal against their convictions on Monday. They have now been escorted out of Chennai Central Prison by British consulate officials. They said they were discussing the next step with the Indian authorities. The Chennai Six: What is their story? Lawyers representing the men say they will have to spend some more time in India before they can expect to return home. The men were working on the anti-piracy ship MV Seaman Guard Ohio, owned by the US-based company AdvanFort, when they were arrested in 2013. They were held along with three Ukrainians, 14 Estonians and 12 Indians when customs officials and police found weapons and ammunition on board, which Indian authorities said had not been properly declared. Initially the charges were quashed when the men argued the weapons were lawfully held for anti-piracy purposes and the paperwork, issued by the UK government, was in order. But a lower court reinstated the prosecution and in January 2016 they were sentenced to five years in prison. The men's families welcomed the acquittal, and some have already spoken to their relatives. Billy Irving's partner, Yvonne McHugh, said that when his call came through as a private number she assumed it was another press call. "Then it was his amazing voice at the end of the phone," she added. "He just said hello and I screamed down the phone. Then he just said 'I'm out'. "He's free. He's actually out of that prison for good. It's just the most phenomenal news I could ever have got." Ray Tindall's mother, Carole Edwards, said: "Half past seven this morning, phone call - hello mum. "Oh, that was absolutely gorgeous to listen to him, I started crying. It was just so lovely to talk to him because there's no communication at all while they're in jail. It's letters or parcels, you can't do anything else. "Oh it'll be such a good present to have Christmas. It'll be lovely." Image caption Ray Tindall's mother, Carole Edwards, said: "It was just so lovely to talk to him because there's no communication at all while they're in jail." 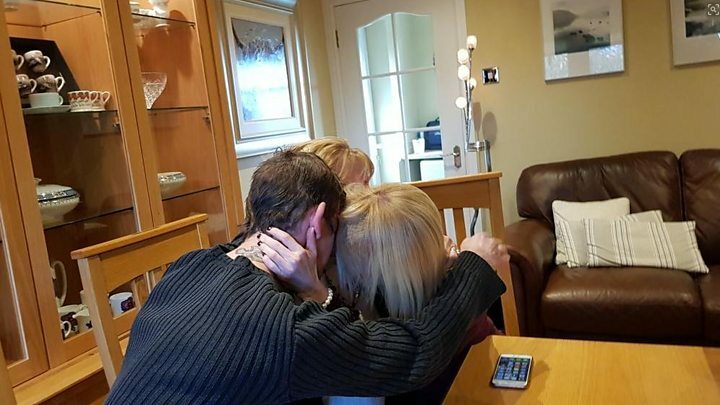 Joanne Thomlinson, the sister of John Armstrong, said: "As ecstatic as we all are at them being released, there are going to be emotional issues around that and it is going to be difficult for them to adapt. "And as well it's not a case that they're on a plane straight home... they're yet again going to have to stay in India while the paper work gets sorted and I think that's quite difficult for them, because they've done that before in 2014 they were released from prison and had to stay in India." A British consulate spokesman said: "The government shares their happiness. "We are working with the Indian authorities to discuss the next step and we will continue to offer the men and their families consular assistance for as long as needed."